With IntellisimTM, a powerful interactive math engine developed by Intellipro, Inc., you can use the CD-ROM to quickly perform dynamic calculations and analysis on over 100 of the most popular equations in this book. If you're a designer, project engineer, plant engineer or engineering student, you will find the answer when you need it. 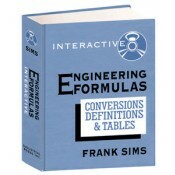 Engineering Formulas Interactive may become the single most useful reference on your bookshelf and in your computer! Minimum system requirements: Windows 3.1/95/98/NT;CD-ROM Drive; 16MB available RAM;10MB available HD space; VGA compatible monitor. • IntellismTM allows you to change parameters at will; calculate results easily; graphically plot results; evaluate formulas for a range of values; and copy formulas and results to clipboard. • Intellism TM supports algebraic, differential, and mixed-equation systems so you'll be able to customize formulas, and modify and combine each formula on the Engineering Formulas Interactive CD-ROM with other equations. • The reference contains over 450 units conversions, 180 term definitions, plus every significant engineering subject with applicable formulas, all arranged alphabetically. • It also includes properties of materials, formulas for geometric figures and formulas for structural sections.